I have in my life taken aspirin when I’ve had a headache. I have installed new copper plumbing throughout a two story house. I have offered opinions on the legality of certain actions when asked. However, I’m not a doctor. I’m not a plumber. And I’m not a lawyer. You may have noticed that on this blog I’ve referred to individuals as historians. I’ve referred to some as “historians”. I’ve referred to others as writers, and to others as chroniclers. There’s a reason for that. I have a rule. It’s my rule, and not necessarily yours. But since you’re reading my blog, you should know what my rules are. In order for someone to be referred to as a (yes, for the 100 millionth time, it’s “a”, check your style manual!) historian by me, they must have earned an advanced degree – at least a master’s degree – in history. That’s pretty simple. There are no exceptions. None. Nada. Whether or not I refer to someone as a historian has nothing to do with the quality or quantity of his or her work in the field of history. It’s simply recognition of their membership in the profession: a profession that, like others, has requirements for membership (educational requirements, peer review requirements, ethical requirements). It’s out of respect for the profession and for those individuals who have satisfied the minimum requirements for membership – requirements that I, at this late stage, will never satisfy – that I don’t throw the word historian around loosely. There are good and bad doctors, plumbers, lawyers, and historians out there, but that does not change the fact that they are who and what they are. And I yam what I yam, whatever that is. Don’t get upset if I don’t refer to you or to someone you admire as a historian when you or they don’t meet my requirements. If it makes you feel any better, the guy in the picture doesn’t meet them either. But feel free to let me know when I make a mistake. 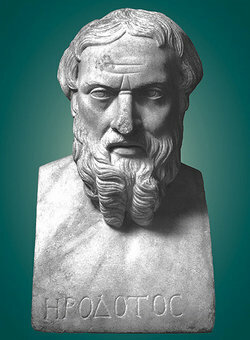 I got the picture of Herodotus from this site – no, I can’t read a word of it. For the moment, I prefer to be called a hysterian, or perhaps, simply, a wiseacre. I’ll go with the latter, for both of us. Harry, a million ‘thank you’s’ for your comment on “an/a” historian. You know how prone I am to bouts of madness and nothing will set off the trigger like the term…” an Historian..”….drives me totally bonkers. Btw, I like this site! Good job. Hey Rick, good to hear from you. Hope to see you soon – in the meantime, check back often! While I’m probably more of a hysterian myself, I’m glad to finally provide a working definition of historian that I am comfortable and can live with. It did draw one question, though — where does this leave all of the folks who completed undergrad studies in history? Are they (hmm, we) considered still embryonic and not yet anything, like lawyers before law school? “Pre-history” like pre-law and pre-med folks? Maybe I answered my own question, I kind of like that…. Yes, Don. I believe that makes you pre-historic. Ba-da-BING! Thanks, folks – you’ve been a great audience. I’ll be here all week.